A broken tube at the washing machine or a leaky pipe at the tap: Even a small leak can cause great damage. The Flood Sensor protects against this by triggering an acoustic alarm as soon as the probes of the device register water. The Flood Sensor can be placed under the washing machine or sink: If there is not enough room for the main unit, the supplied sensor cable and bracket can also be used. As soon as the device detects water on its probes, an acoustic alarm is triggered immediately. 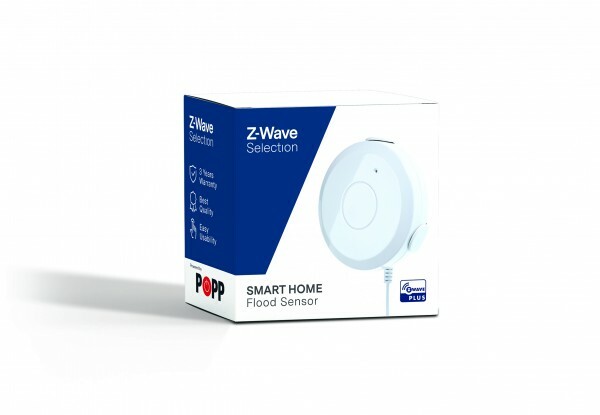 In addition, the LED starts flashing and the alarm is sent to the Z-Wave control center. From there, you will receive a message about the incident on your smartphone and can act quickly, even when you are not at home. The Flood Sensor is water proof (security class IP44) and can therefore also be used outdoors. Connected to other intelligent devices, such as the Flow Stop shut-off motor, you can also stop the water automatically when a leak in the water pipe occurs. If you take precautions, you will not be left out of the way: Avoid major water damage with this small, intelligent device and save yourself a lot of unnecessary annoyance. Related links to "Flood Sensor"